On September 23 and 24, the NBA hosted its second annual hackathon at Skylight Modern on 27th Street in New York City. 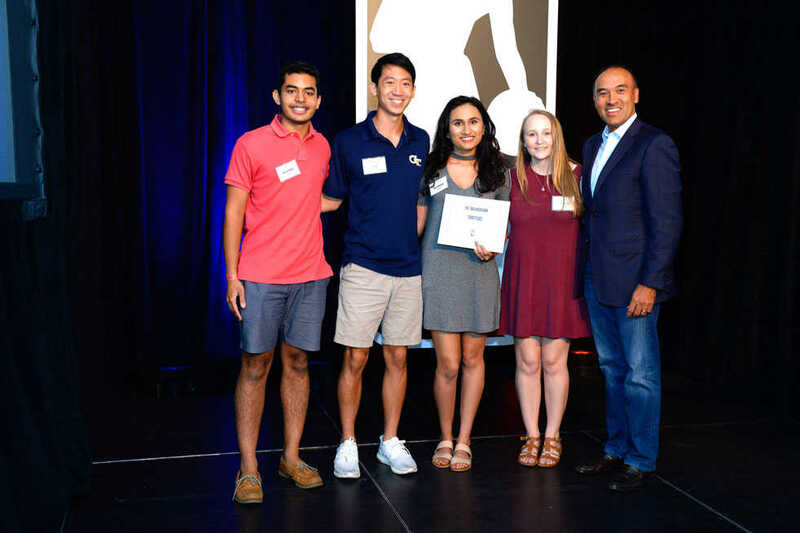 Four Tech students — second-year IE Nishant Reddy, third-year CS Nikki Cantrell, third-year IE Alan Lo and third-year CS Mayuri Mamtani — competed in the basketball analytics competition and placed third out of more than 200 participants. For the students, the road to New York began over the summer. The NBA would receive 900 applicants, of which, only 207 were accepted. While parts of the application were optional, they were strongly encouraged. “There was one question which was covered in one of my ISYE classes, so that was kind of cake,” Lo said. “The rest of it was coding.” The coding project required the applicants to take box scores from the 2016-2017 season and determine when teams were eliminated from playoff contention. The group, dubbed “Team Alley-Oops,” did not finish the project, but the incomplete work they supported was enough to convince evaluators of their potential. In late August, the group heard back from the NBA that they had been accepted; however, the NBA did not provide travel, so the group convinced the College of Computing to sponsor their travel. Going into the hackathon, they did not know with what they would be tasked. After arriving early Friday morning to explore the city, the team began their new project Saturday morning. “Alley-Oops” decided to tackle a possible rule change dealing with offensive fouling, specifically dealing with collisions around the restricted area. Currently, the restricted area, designated by a small arc inside the paint, is four feet from the basket. It is restrictive in that no defender can force a charging foul in the area, save for some occasional exceptions. “What we planned to do was expand that restricted area for three reasons,” Lo said. “First, to decrease the number of injuries that might occur.” More offensive fouls mean more charges being called, which can lead to an increased risk of injury. This was particularly apparent to Cantrell and Mamtani, who were not devout fans of the sport. While the idea was solid on paper, the team needed data to back it up. This data came from the large data pool the NBA had given them a few days before. With a clear relationship in place, the group needed to show where those fouls were occurring to justify their arguments. Their heat map pointed to almost all offensive fouls occurring just outside the restricted area. They presented their findings in front of a group that included such figures as ESPN writer Zach Lowe, members of senior management for a few NBA teams and FiveThirtyEight editor-in-chief, Nate Silver. Their third place finish not only won them a gift card to the NBA Store and merchandise from JBL but also the chance to meet NBA Commissioner Adam Silver, former player Shane Battier and a host of league insiders. Not bad for a weekend’s work.